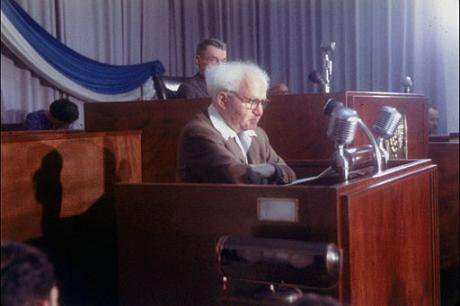 David Ben Gurion speaking at the Knesset, 1957. Wikicommons/National Photo Archive. Some rights reserved.Words trail meanings beyond their formal definitions. Raymond Williams in his Key Words leads us through the dizzying journeys that words we thought we knew well have taken over their history. For example, who nowadays brings to mind what ‘Protestants’ were protesting about? Or take ‘fascism’. This theory and practice of authoritarian politics is now so entangled with its delivery of the holocaust that outside academia it is used as a swear word plain and simple. "There is no radical left in Israel. Such a left is anarchist and sometimes even terrorist, as in Europe and Latin America. In Israel, where even Isaac Herzog is seen as “left” and Yair Lapid as “center” – when they’re both moderate right – what counts as radical left is the only left that exists here, and that is moderate left. All the rest are 50 shades of right wing, with an alarming, herd-like consensus and too little real difference of opinion. The litmus test isn’t whether you identify with the left or right, but whether you identify with Zionism, that deceptive, undefined, anachronistic, expired value that distinguishes between legitimate Israelis and the rest. Are you on our side or the enemy’s? Say “Zionist” and you’re not radical. Good, you’re saved. Say “not Zionist” and you’re out. A pity, you’re extinct. When Zionism is a religion, heresy is treason. Anyone who dares to undermine Zionism’s validity, as the majority sees it, is radical left, illegitimate, and lately even criminal...."
- only 42% believe Israel wants peace. - only 38% believe "Israel is civilized and Western". - only 31% believe Israel is a democracy. - no less than 21% believe The US should side with the Palestinians.